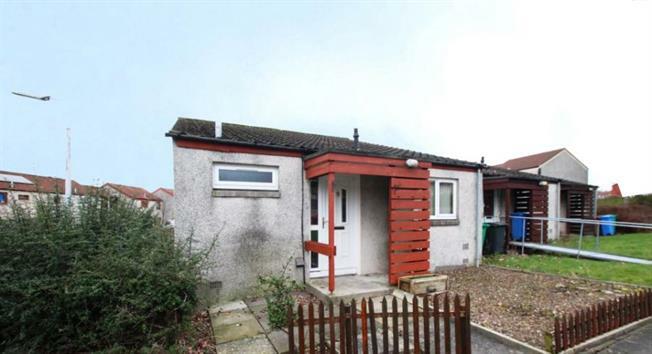 1 Bedroom End of Terrace Bungalow For Sale in Glenrothes for Offers Over £68,000. This one-bedroom bungalow is located in the popular Stenton Precinct of Glenrothes. Neutrally decorated throughout, the property would be ideally suited for a first time purchaser, couple or those looking for accommodation over one level. The property boasts double glazing & gas central heating with the main accommodation comprising of; entrance hall with an abundance of storage cupboards, lounge to rear with doors to the partially double glazed rear entrance porch and to the fitted kitchen. The kitchen is to the front of property and is fitted with base and wall units, complimentary work surfaces and stainless steel sink with space for free standing appliances. The double bedroom is to the rear of the property and the bathroom fitted with white suite is to the front. The front and back gardens have been chipped/paved with ease of maintenance in mind.